These fine recordings came to me from the collection of Edward Johnson, who seems to have not only a superb collection but also an unerring touch when it comes to selecting fine recordings in need of XR remastering and full reissue. Although the Mendelssohn symphonies have resurfaced elsewhere in the digital era, it is unlikely that other transfers will have dealt with the harsh, boxy, unpleasantsound of the originals. This is one of those occasions when XR remastering has made a huge difference, so much so that I've prepared a before-and-after sample which takes a 45-second section from the first movement first in its raw, straight-from-the-LP version, and then in its final, XR-remastered Ambient Stereo form - the difference in indeed dramatic! It's replayed from a 320kbps MP3 file, which can also be downloaded here. The release was unusual in its day - Mitropoulos's brisk reading of the Symphonies (his first movement is a full four minutes shorter than a more recent release conducted by Sir Colin Davis, for example, despite there being no cuts) allowed Capitol to squeeze both recordings onto a single LP whereas other contemporary issues required two sides per work. For some this may be too brisk, or the gaps between movements too short (I've not lengthened them), but others may find them to be, in the words of Edward Johnson, "great, panache-laden" performances. "The New York Philharmonic commissioned Gould's Philharmonic Waltzes in 1947* as an accompaniment to a fashion show, believe it or not - a fund-raising benefit for the orchestra. This is a quintessentially American idea, I think: pleasure + pleasure = more pleasure. Great music plus good-looking women in pretty clothes gives you more than merely great music. Gould came up with music that transcends its silly occasion. It celebrates movement and would make a terrific ballet. You can practically see a Balanchine corps de ballet as the music plays. 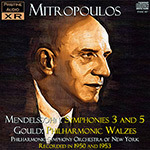 I also find it an interesting example of what I call the "Broadway waltz," of the kind written by Richard Rogers and Leonard Bernstein..."
"Morton Gould wrote his Philharmonic Waltzes especially for Mitropoulos and the Orchestra's 1948 Annual Ball and Pension Fund Concert. The work is in three short, contrasting sections: The first is what Gould calls "a commentary on an old fashioned Gay-90's-type waltz" (with echoes of a player-piano and street tunes); the second section is reflective and nostalgically romantic; and the third is a fast and highly stylised Continental-type waltz..."
We intend to return to the music of Morton Gould in greater length in a forthcoming release - in the meantime this short taster of his work offers something which manages to both contrast and complement the Mendelssohn which precedes it. Again I have been able to make great inroads in terms of sound quality here, though this 1950 recording was significantly better than its 1953 cousin to begin with!